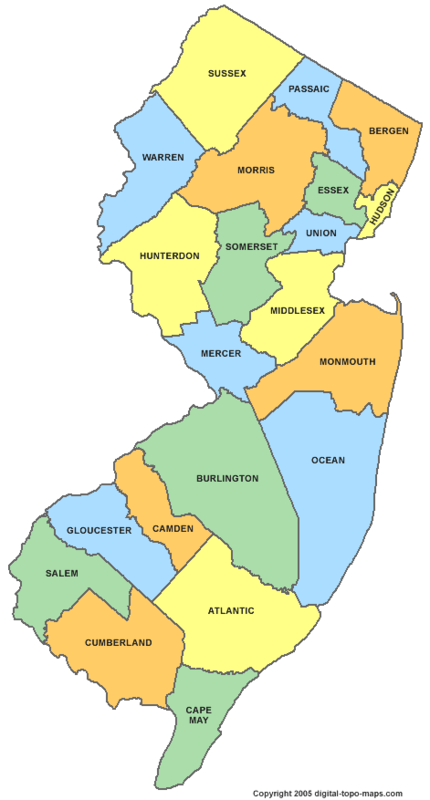 According to 2011 county population estimates released by the Census Bureau, the fastest-growing New Jersey counties between 2008 and 2011, in the wake of the Great Recession, were Hudson (+8.3 percent), Middlesex (+3.7), Union (+3.4), Passaic (+2.8), Bergen (+2.4) and Essex (+2.4). Surprisingly, this list coincides almost exactly with the list of the most developed counties in the state (Hudson, Union, Essex, Bergen and Middlesex are the five most developed counties, while Passaic ranks 11th). In a dramatic reversal of New Jersey’s development pattern of the last 50+ years, the last three years have seen the state’s most urbanized counties growing the fastest. In the top three fastest-growing counties from 2000 to 2008 – Gloucester, Ocean and Somerset – average annual population increases dropped dramatically after 2008. Among the 10 fastest pre-recession gainers, only Middlesex – the most urbanized of the 10 – gained more residents on an annual basis between 2008 and 2011 than it had between 2000 and 2008. After nearly 60 years of unrelenting outward suburban expansion from the old industrial urban cores, the future of human settlement in New Jersey – and in the rest of the United States –appears as if it might be reshuffling itself once again. As has been documented at the national level, older, already-urbanized places have been weathering the economic downturn that began in 2008 better than other places, particularly the far-flung “exurbs.” But the recession may simply have been the catalyst for a comeback for “walkable urbanism” that had been brewing for a while. In fact, observers (including the Rutgers Regional Report (pdf) and New Jersey Future) have previously noted various signs of a rebound by urban centers and older, built-out suburbs. 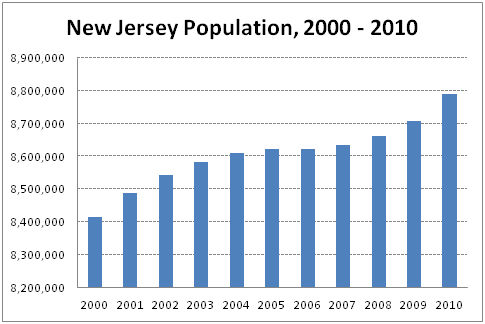 The Census Bureau county population figures for 2011 reaffirm, in sometimes dramatic fashion, that the pattern of exurban retreat and walkable urban revitalization is manifesting in New Jersey. It is truly remarkable that the list of the fastest-growing counties over the last three post-recession years is dominated by a group of largely built-out urban and inner-suburban counties. With the exception of Middlesex, the southern half of which is still relatively undeveloped and has grown rapidly in recent decades, none of these counties has found itself near the top of the growth list since the 1940s, when Bergen County last cracked the top 5. In fact, many of them had become accustomed to population losses being as likely as gains, with Hudson, Essex, Bergen and Union counties having all posted population losses in at least two decades since 1950. The turnaround is nearly as striking in the other direction. Outlying counties like Ocean, Somerset, Gloucester and Hunterdon, which consistently appeared near the top of the growth list in the post-war era, are now seeing their growth rates cool off considerably in the wake of the recession. In some cases, suburban growth has even morphed into actual population losses. Of the six counties that lost population between 2008 and 2011, only one – Camden – is primarily urbanized. The other 2008-2011 population losers – Sussex, Monmouth, Warren, Hunterdon and Salem – are mostly (with maturing Monmouth being something of an exception) lower-density, farther-out bedroom communities, where people generally commute to jobs closer to the urban core. Restricting the analysis just to the last year (2010-2011) changes the picture only slightly; all of these counties except Monmouth still lost population, though at slightly slower rates than between 2008 and 2010. The reversal becomes most clear when looking at what used to be New Jersey’s real exurban frontier – northeastern Pennsylvania. Fueled by out-migrants from New York City and New Jersey, Pike and Monroe counties in Pennsylvania’s Pocono Mountains were the first- and third-fastest growing counties in the entire Northeast in the 1990s (+65 percent and +45 percent growth, respectively), and ranked first and second from 2000 to 2005, far outstripping any New Jersey county in either period. But the last few years have rewritten the playbook: Monroe County grew by only 2.6 percent between 2008 and 2011 and Pike County actually declined by 5.2 percent over the same period. The flight to the exurbs may be a thing of the past, a casualty of four years of economic stagnation, a housing market collapse, $4-per-gallon gasoline and Millennials in search of walkable urbanism. “Driving til you qualify” is no longer a trade-off that makes economic sense. Of course, a slowdown in population growth does not necessarily mean a slowdown in the rate of land development. Large-lot zoning conspires to continue eating up our last open spaces even in the absence of much net population growth (or none at all, as in the cases of Buffalo and Pittsburgh). But perhaps the economic reality check delivered by the housing market collapse might serve to put the brakes on that phenomenon as well. Has it occurred to anyone that counties like Hunterdon, Morris,and Somerset have been virtually destroyed by Highlands and DEP regulations, and the accompanying loss of property value and devaluation of the work force (means of making a living out here) have also contributed to letting any kind of growth know that this is not the place to invest? Growth did in fact skip past us into Pennsylvania from about 1995 to 2005, as you noted, and it is no secret to those of us who live out here that that occurred because our Highlands area was in such an administrative mess that to try to develop here was next to impossible and growth just skipped by us. You may think that is good, but the water restrictions here, which do not apply in the other counties south and east of us, have now been set up to grow as much as possible in the counties you note are now experiencing heavy growth. Mark my words, the next place to become a problem will be the overdevelopment in those very lower down counties you highlight in your article. It was a set up by some very stupid and greedy assembly people from “down there” that made this a reality. I agree that unchecked greed is wrecking havoc with our world and microcosms also reflect this but as such this is why we need regulation balanced with Smart Growth and collaborative planning over the long haul. It costs more to clean water in the future than keep it clean now as the Highlands was instrumental in advancing but we have not yet acknowledged the value of natural/life support systems and perhaps then also not sufficiently considered same for the up county water bearers. Further down county growth must consider the flood waters which will continue to rise and plan for permeable spaces. Our cities have lots of infill and rehab structures and NJ Clean Energy promotes incentive for green building which further prevents inappropriate development.